Come enjoy an intimate dinner on the river with your loved one. Our Valentine's Dinner cruises are sold as couples tickets only and include intimate seating, live entertainment, two hour cruise, surf and turf dinner for two, roses, commemorative champagne flute, climate controlled reserved seating and cash bar access. 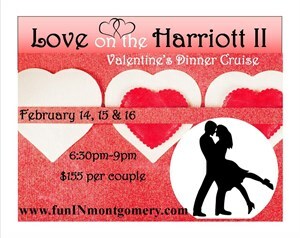 The Harriott II offers a unique Valentine's experience unlike any other. Don't miss out on being able to show your loved one just how much they mean to you by celebrating aboard the Harriott II! Don't miss the boat this Valentines!